"When we look back on today, this will be the moment we will be able to say that the political tide has turned on the rising seas." "Today is a good day for the country, for the climate movement, and for all humanity." After years of congressional inaction and minor policy tweaks that failed to address runaway global warming with the urgency and ambition the science demands, experts and advocacy groups representing millions of Americans hailed Rep. Alexandria Ocasio-Cortez (D-N.Y.) and Sen. Ed Markey's (D-Mass.) Green New Deal rollout on Thursday as a "watershed moment" in the fight against the climate crisis that—with enough grassroots mobilization—could usher in a bold new era of action. "This is a historic moment made possible by a grassroots movement (you!) of people fighting for the just climate solutions we need." "We must be as ambitious and innovative in our solution as possible," Ocasio-Cortez declared during a press conference unveiling the Green New Deal resolution, which calls for a "national mobilization" to transition to 100 percent renewable energy by 2030. "We're here to say that small, incremental policy solutions are not enough." "There is no justice and there is no combating climate change without addressing what has happened to indigenous communities," the New York congresswoman continued. "That means that there is no fixing our economy without addressing the racial wealth gap. That means that we are not going to transition to renewable energies without also transitioning frontline communities and coal communities into economic opportunity as well. That is what this is about: It is comprehensive, it is thoughtful, it is compassionate, and it is extremely economically strategic."
. @AOC speaks about her resolution for a Green New Deal to tackle the systemic crises in our country: climate change, deepening structural racism, and skyrocketing inequality. "The sun is setting on the dirty energy of the past," Markey wrote on Twitter following Thursday's press conference. "Today marks the dawn of a new era of climate action. When we look back on today, this will be the moment we will be able to say that the political tide has turned on the rising seas." In an indication of how quickly a previously marginal policy proposal has burst into the mainstream, "Green New Deal" appeared at the top of Twitter's trending list in the United States on Thursday as the proposal also garnered front-page newspaper coverage and editorial board endorsements. "This is a historic moment made possible by a grassroots movement (you!) of people fighting for the just climate solutions we need," said 350.org, one of the organizations that has helped organize and lead Capitol Hill protests in support of the Green New Deal in recent months. 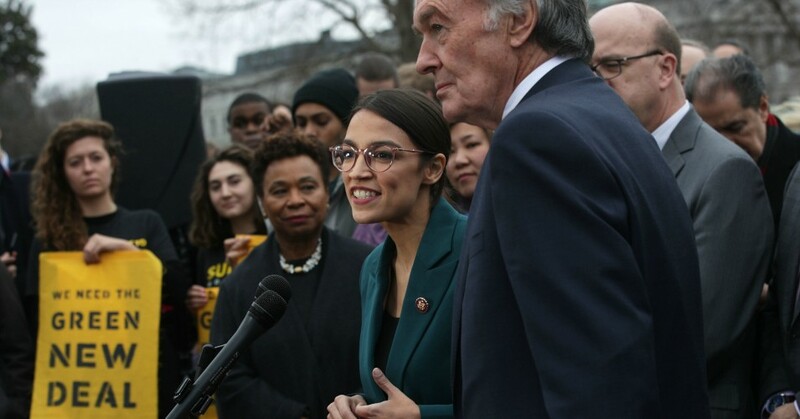 The historic Green New Deal resolution introduced by @AOC and @SenMarkey has 64 House Co-Sponsors and 9 Senate Co-Sponsors. As essential components of a comprehensive and just transition to 100 percent renewable energy in just ten years, the Green New Deal resolution (pdf) also calls for universal healthcare, a federal jobs guarantee, massive infrastructure investment, and affordable housing. "Senator Markey and Representative Ocasio-Cortez are telling the truth about what it will actually take to prevent climate catastrophe—a WWII-scale climate mobilization that eliminates greenhouse gas emissions in 10 years and draws down excess [greenhouse gases] from the atmosphere," said Margaret Klein Salamon, executive director of The Climate Mobilization. "We will continue to fight to protect humanity and the natural world by telling the truth about the climate emergency and addressing it at the speed and scale required," Salamon added. While environmentalists were overwhelmingly supportive of the path-breaking Green New Deal resolution, they also pointed out—as Ocasio-Cortez herself acknowledged during Thursday's press conference—that it is just an initial step that must be built upon and improved. In particular, green groups expressed concern that the resolution does not mention the words "fossil fuels," even as scientific research makes clear that continued oil and gas extraction in the U.S. threatens to undermine global efforts to drastically slash carbon emissions before it's too late. "We urgently need a bold and ambitious Green New Deal that tackles fossil fuels head-on," Wenonah Hauter, executive director of Food and Water Watch, said in a statement. "We support the ambition and scale of this resolution, and we are heartened by its recognition that climate change poses a grave threat to healthy food and clean water, but any legislation that does not explicitly address the urgent need to keep fossil fuels in the ground is insufficient." Noting that there is still "much work to be done," 350.org founder Bill McKibben concluded, "let's celebrate the fact that—thanks to the Sunrise Movement, AOC, Sen. Markey, and many others—there's now climate legislation in Congress that actually addresses our greatest crisis at its actual scale."